GREEN BAY — Jerry Jones says it’s one of the most disappointing years during his time as owner of the team, but at 4-8 the Cowboys are only a game out of first place in the NFC East. The Cowboys can move into a first-place tie with a win over the Packers at Lambeau Field this Sunday. At 8-4, the Packers are tied with the Vikings for the NFC North lead. “There’s tremendous urgency each week. There are only 16 of these opportunities and every one of them is so meaningful. When you get down toward the end of the season and the games are fewer and the impact of the games in terms of the playoffs is so huge, there’s a tremendous sense of urgency. It’s one of the great things about the NFL,” Cowboys Coach Jason Garrett said. of the December playoffs race. The Cowboys are without quarterback Tony Romo, again. He remains on their active roster, with the hope the team will qualify for the playoffs and Romo can return to action. Matt Cassel helped score a win in Washington this past Monday, but the Cowboys’ hopes rest with their defense, No. 5 in the league. The Cowboys are No. 27 on offense. “Our defense has to step up. Our running game has to step up. Our kicking game has to have an impact on the game. 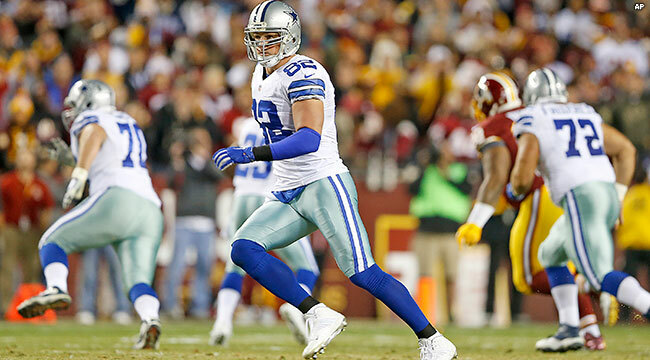 When you have injuries, everybody has to step up to give you a chance to win,” Garrett said. The Packers will be on 10 days rest; the Cowboys are on a short week. “Regardless of what the schedule is, we have to be ready to play our best football,” Garrett said.